Last week, Camden council voted on the latest set of plans for the Abbey Area regeneration (that’s the council development around the Abbey Road/Belsize Road junction. James King, who’ll be standing for the Lib Dems in that ward in next year’s local elections, went along and has reported back. There is also extensive documentation for this on Camden’s planning portal. 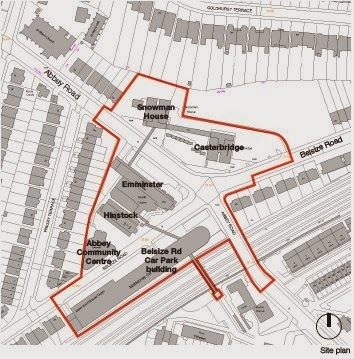 The ‘Abbey Area’ development was on the agenda of Camden Council’s planning committee. Not for the first time. Planning approval was first granted 18 months ago for the council’s own scheme to redevelop the buildings. Given that these ideas have been under discussion for six years, you might have thought the council would have worked up a well-thought out plan, commanding community support. It didn’t turn out like that. Although the re-modelled scheme was voted through by a handful of councillors, others on the committee abstained, having exposed a number of weaknesses. Phase 1 – Demolition of the Belsize Road car park which also houses several businesses; construction of a 14-storey tower at the junction with private flats, a small supermarket space on the ground floor and an ‘energy centre’ in the basement. This will be attached to a six storey housing development with further private housing and new council properties. Shops and commercial office space will be provided on the ground floor. Phase 2 – Construction of a health centre space at the base of Casterbridge tower and a new community centre at the base of Snowman tower . This new building will also include a covered courtyard connecting the two tower blocks. Phase 3 – Demolition of the Emminster and Hinstock council housing blocks, the Abbey Community Centre, Belsize Priory Health Centre, shops and the Lillie Langtry pub. A new 6-7 storey housing block will be built around Belsize Road and Abbey Road, with shops opening out onto a ‘central urban realm space’. 15 ‘mews style’ houses will run alongside the back of Priory Terrace. The application discussed at the meeting included detailed proposals for Phase 1 only, and sought fresh ‘outline’ permission for Phases 2 and 3. There are many question marks associated with the development, including the increased height of the tower building, the disappointingly low number of shared ownership flats, and uncertainty for tenants and businesses in the buildings earmarked for demolition. But the planning committee focused particularly on the loss of trees and open space. Although the papers didn’t make this very clear, the development identified 44 trees for the chop. This looked like lazy design, and Lib Dem Cllr Flick Rea led the charge in forcing the council to concede that they will do further analysis and consultation before deciding whether to remove most of the trees. Meanwhile, councillors of all parties were critical of the design of the new Phase 1 housing block, which eats up the green space in front of the car park. They were rightly unimpressed by the council’s attempt to argue that the redesigned junction (rebranded rather ludicrously as a ‘central character area’) would act as a new open space for young kids. It then emerged that the council is exploring a half-baked plan to remove the traffic lights from one of the busiest junctions in NW6! The committee did eventually approve the scheme, but the meeting confirmed my view that this development scheme has lost its way. Although it started life as a regeneration initiative, there has been no real attempt to get buy-in from the shops and other traders on Belsize Road and Abbey Road who are affected. No local residents voiced support tonight, and the Kilburn ward councillors were absent from the meeting. Although £2.3m has been spent on various consultants, who organised blue skies workshops and produced glossy brochures, when it came to the planning consultation, nobody from the council bothered to organise a local meeting clearly setting out the plans on the table. This is not the end of the road. The council has still to work up its detailed scheme for Phase 2 of the development, which is particularly contentious. And the construction phase of the project is likely to take five years or so. 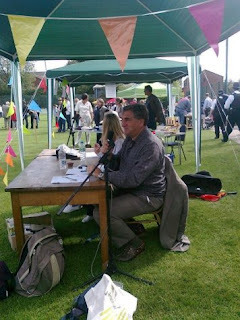 So lets hope that the local community is better involved in shaping the project from here on in. 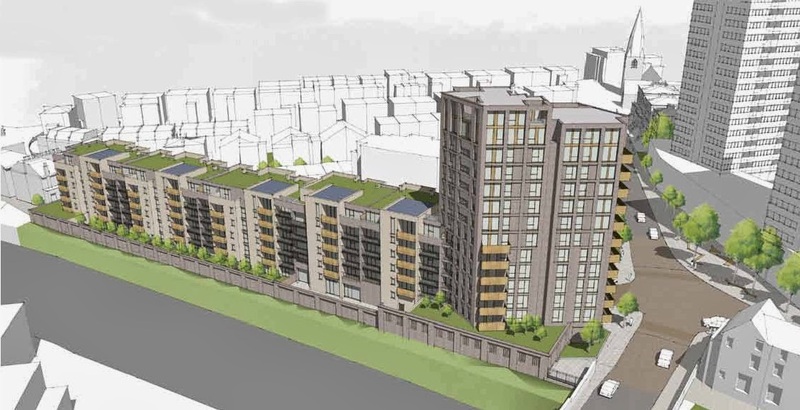 Is Liddell Road tower a “middle finger to West Hampstead”?